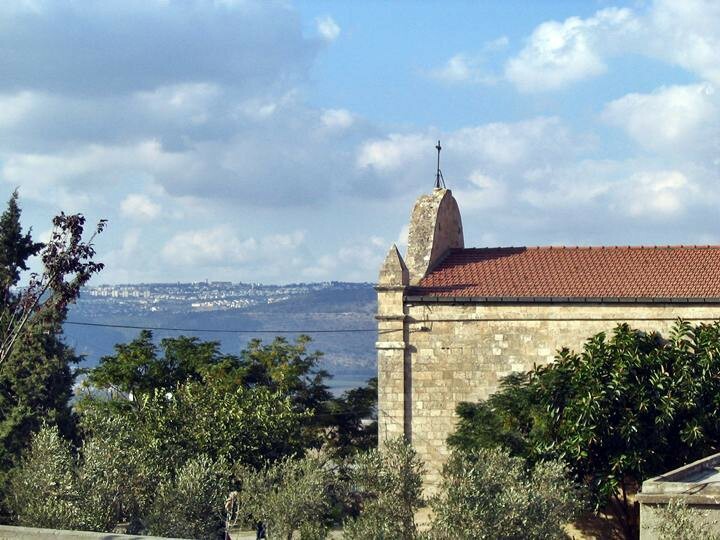 This village is located south of Mount Tabor, and built on the ruins of a Roman village, where according to Luke, Jesus performed a miracle, bringing the widow's son back to life. Today, the site is called "Naim", an Arab village which is located on the road to the city of Afula, on the northern foosteps of the hill of Givat Hamoreh. The site is most likely the village referred to in the New Testament, since it is located close to Mount Tabor and Nazareth. Nain was inhabited in Jesus' day and preserved the name. The area of the village was inhabited from the Middle Bronze period, according to survey of ceramics in the graves around the village. It was probably a continuation of the earlier site in Tell Agol during the Hellenistic period (332-37BC). The village reached its peak in the Roman and Byzantine periods (37BC-640AD). The ancient village lays under the new village, in the area of the new Church. According to some ancient texts, the Roman village was surrounded by walls. The photo shows the new Church, built in 1880 over the ruins of the Roman village. In the background, behind the church, is the city of Nazareth. For more info on this site and additional photos, click here. Lk 7:11-16: "And it came to pass the day after, that he went into a city called Nain; and many of his disciples went with him, and much people. Now when he came nigh to the gate of the city, behold, there was a dead man carried out, the only son of his mother, and she was a widow: and much people of the city was with her. And when the Lord saw her, he had compassion on her, and said unto her, Weep not. And he came and touched the bier: and they that bare him stood still. And he said, Young man, I say unto thee, Arise. And he that was dead sat up, and began to speak. And he delivered him to his mother. And there came a fear on all: and they glorified God, saying, That a great prophet is risen up among us; and, That God hath visited his people".